Many stories are told about Screaming Sheila Bridge – Moeller Road. One is that in the mid-1800s, a woman was convicted of practicing witchcraft and burned alive on the bridge. There is now a hole completely through the bridge. She is heard screaming at night. Another story is that in the early 1980s, an Electra High School Prom Queen named Sheila hwas hanged by a jealous group of girls. Some say Sheila was burned alive on the bridge, evidenced by a large hole burnt completely through it. And a third story is that in the 1970s, a man and his wife were driving and arguing when they drove off the side of the bridge. The man escaped, but the woman (Sheila) was burned alive. I grew up in Electra. The hole in the bridge was caused by a group of teens having a bonfire on the bridge in the late 1970’s. I personally know the people who did it. Its now blocked off with striped barriers. If people go there at night, the current land owner WILL shoot at them. I had the unfortunate luck of directly experiencing that for myself. Are you for real my friends want to come see this thing and I was thinking of going with them but the other comments make me other wise. I weng out there on numerous occasions when I was younger and on atleast three of those something weird happened. And yes, I have witnesses. It’s just way too much to put on here using my phone. But I agree with the above post, the owner will shoot you now if you go out there. Me my best friend and my wife went out there 1:00 to 3:00 am on the 1st of August. My wife was experiencing some weird stuff as we walked back there. My wife felt really hot and she heard some screaming as we got closer and then when she asked if we could please head back as we were walking away she felt someone staring at us and then heard a girl laughing. My buddy also told me him and his little brother went at night too. His brother “committed suicide” about a week later. There is no need to go see this place, it is not haunted at all. Military Paranormal Investigations debunked every paranormal claim/folklore. It was caused by a bon fire under the bridge. 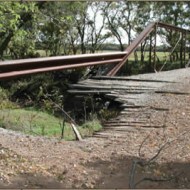 The main bridge structure was built with old rail road ties, with heavy tar on them that caught fire. You can see how the flames came from under by the burn marks on the sides. The hole was caused by the actual bonfire itself being the hottest part. Like all other posts have stated, the owner will shoot, which is why you need permission. I was there the night the bridge was set on fire. it wasn’t set on purpose, just a bunch of teenagers partying and a couple of dudes (no names mentioned) decided to build the bon fire on the bridge instead of on the road like we had done in the past. this was a hangout for high school kids to go and party. fun times, but after that night, we stopped going. oh, by the way, not haunted!!! Went today actually and there is no hole now if there ever was one and nothing happened. Also it’s on public land just so everyone knows.